Will she make it to next Christmas? Will he make it to Downing Street next year? And why is Damian Green still there? It was the questions about the main players that prompted most excitement at the final prime minister’s questions of the year. 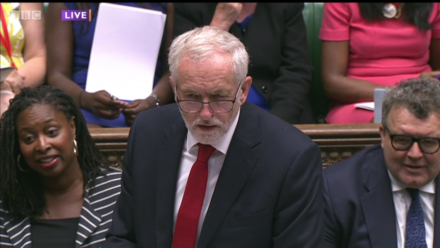 Both Jeremy Corbyn and Theresa May emerged from the final half of debate – or more like 50 minutes, given how long John Bercow likes to let things run – feeling like it was job done. There was more heat than light but the Labour leader will be pleased that he managed to land his points on the NHS. The lesson for him is clear – to concentrate on one subject and try to pull apart May’s arguments because we know she gets weaker under pressure. Corbyn kicked things off by asking about the state of the NHS, with Christmas just five days away. This is the tried and tested approach of opposition leaders in December. The health service faces almost unbearable pressures but the newspaper headlines about a “winter crisis” have yet to materialise. Don’t be under any illusions, however, about the challenges it faces. “Is the prime minister satisfied that the NHS has the resources it needs this winter?”, Corbyn asked. May, of course, didn’t have much of an answer, saying simply that the service had prepared “more extensively” than ever before. Corbyn read out a long list of NHS failings – including over social care, the issue which had prompted May’s humiliating general election u-turn and scuppered her chances of retaining a majority. It must have felt like pressing on a bruise. “The prime minister has shown just how out of touch she is,” he added. “Our NHS is being recklessly – recklessy – put at risk by her government”, providing him with a couple of decent clips for television news and Twitter. He went on to ask about the 50,000 people he said were left waiting on hospital trolleys last month and then issued an effective challenge to May: could she give a “cast iron pledge” that waiting time targets would be met in 2018? It was a tough one and a good one. We know May doesn’t like giving guarantees over anything – even such basics like whether the contents of her manifesto will actually make it into government policy – and she veered away from that one as if it were an exotic Christmas party cocktail. The debate was, essentially, a stalemate, as it so often is between this pair. Corbyn has undoubtedly improved over the year and learnt that he is best served by leaving the scatter-gun at home and focussing on a single issue. May struggles on, and her answer to Rosena Allin-Khan on homelessness seemed technical and remarkably devoid of empathy, given the time of year. Yes, May has received a short-term boost from her deal with EU leaders that allowed Britain to move on to the second phase of Brexit talks but that uplift won’t last long. Her delivery at the despatch box is flat in comparison to the Flashman-style theatrics of David Cameron. The Tories followed May’s answer to Corbyn’s final question by roaring “more, more, more” to try to create the impression she had triumphed over her opposite number. This was from the case. Much as she would like to do steamroller her opponents, the prime minister can only deliver her messages in a sedate style. Corbyn will have been pleased with how it went – as, bizarrely, will May, even though she began the year with a healthy majority and expectations of an increasing it. The PM has survived when many said it was impossible. Labour’s leader – judging by his forecast that he will “probably” PM next year – feels he is on the brink of power. That is understandable after the journey that he has first endured, and then enjoyed, throughout this year. The chances of May’s government falling still appear to be slim, however. Tory backbenchers whose rock-solid majorities have been converted into marginals would not, surely, support another snap vote. Do Tory turkeys vote for Christmas? Either way, Corbyn’s progress this year has been eye-catching. He is a near-certainty to be there fighting on next year.